Over the course of the year, Alt_Art is happy to host a number of exciting events, hoping to encourage young and aspiring Creatives to get out there and find success! Here you'll find a host of events that have been and gone, but the memories still linger on! Big or Small, every event with Alt_Art is a step forwards to bettering out community! If you want to stay in the know, and be kept up to date with Upcoming events or Possibly actively get involved, why not join Alt_Art as either part of our Club or as a Creative! Alt_Art's official gallery launch was on the Saturday as part of Reactivate Latrobe Valley's Winter Nights Festival. The event was hosted at The VRI, utilising the Gallery Foyer and the Hall itself! The evening had activites for young and old, live performances and of course Art and their respective Artists. Following on the success of Un- and Constellations, Alt_Art put the word out and invited everyone to welcome the Sunflowers in with a "Sunflower" themed exhibition! Such a beautiful day, filled with such vibrant and beautiful colours! In the month of April, whilst waiting for the Sunflowers to bloom, We had our 48hr Film Festival! Ran from The VRI, by the talented minds at Nanoo Nanoo Art. 4 Teams went in and on the other side, 4 Short Films! Judged by a very special team of Judges! What a brilliant event for the Valley! 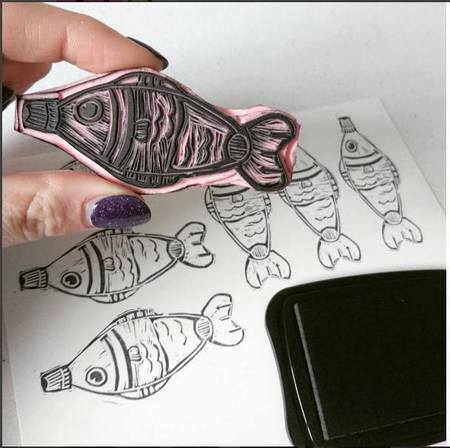 In the month of June, Meghan from MadebyMeg, ran a Stamp making Workshop. The weather was beautiful and a lot of smiles and laughs were had by all who attended! We look forward to running many more exciting workshops in the future!